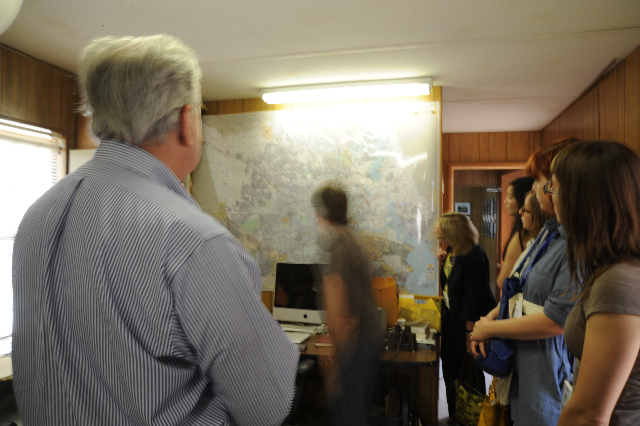 AAM conference attendees took a bus to the Center for Land Use Interpretation’s Houston Field Office, located on the banks of Buffalo Bayou on the site of a former junkyard, as part of a special onsite/insight tour Monday morning. AAMers were given a tour of the office by the Center’s founder/director Matthew Coolidge, who came to Houston in 2007 to establish a base from which to study the gulf coast region and the petrochemical industry as part of an ongoing residency with the University of Houston Cynthia Woods Mitchell Center for the Arts. The field office is a gray, generic office trailer that features exhibitions based on the Center’s research. Currently, the office has a focused exhibition featuring photographs and a video that debuted as part of the Blaffer Art Museum exhibition Texas Oil: Landscape of an Industry. Matthew discussed the Center’s research with AAMers from the organization’s projects across the country to the stories behind the works on view in the field office, which showcase the public face of the petrochemical industry in Houston through “portraits” of the most prominent companies’ Houston headquarters and an aerial “landscan” HD video of the Houston Ship Channel. The exhibition section of the field office is open to the public by appointment, but AAMers got a special behind-the-scenes view of the section of the office where members of the Center live and work while conducting their research, including some incredible maps of Houston and ship channel used by the Center. 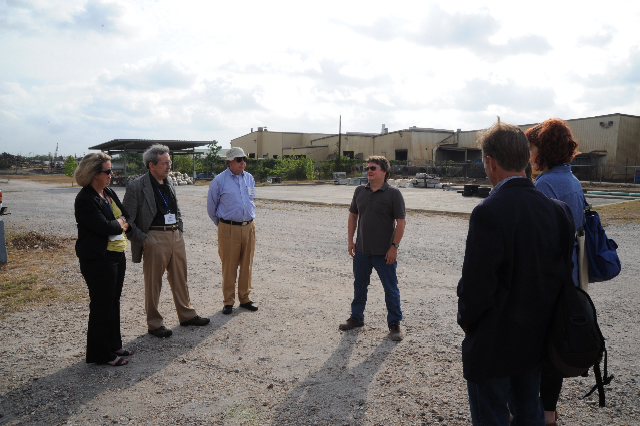 After their tour of the field office, the group went to the banks of the bayou itself for a view of the scrap yard of the Proler Iron & Steel Company, an international operation of steel and metal recycling. Sparks were flying as giant cranes lifted heaps of metal into barges floating on the bayou accompanied by an unforgettable crashing sound. Further down the shore, AAMers saw the boat that the Buffalo Bayou Partnership (BBP) uses to clean debris from the surface of the water as well as a new boat commissioned by the Mitchell Center and BBP as an interpretive research platform to present programs on the waterway. The boat, called Tex Hex, was designed by the design-build group SIMPARCH to show films, record live video, and serve as a self-contained living area with a sustainable energy infrastructure. 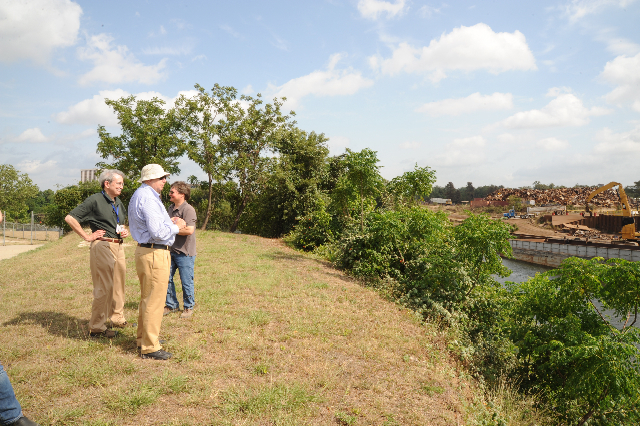 Matthew described the history and current significance of the confluence of the Buffalo Bayou with the ship channel, including how channel was dredged after the 1900 hurricane that destroyed Galveston and is now the center of the US energy industry. As part of this onsite/insight, AAMers had a chance to see an aspect of Houston not often glimpsed by the public, but at the heart of the city and the nation’s supply of energy. They experienced a unique project that is a museum, residency, research project and off-the-grid outpost. Many of us from Blaffer, the Mitchell Center, and BBP have been enriched by our association with the Center, and we were excited to welcome our colleagues from all over the nation as part of the conference and hope they will stay in touch and keep abreast of the Center’s projects in Houston via the UH Cynthia Woods Mitchell Center website and the Center’s newsletter Lay of the Land.